Don't let the title of this film mislead you. It's not a ghost story in a traditional sense, and really, that subtitle should be dropped. 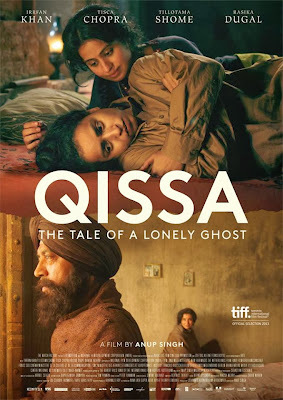 QISSA is a powerful tale of finding one's true identity and place in a society filled with specific roles and expectations. Umber Singh (Khan) is a Sikh who has been displaced during the 1947 Partition. After years of putting his life back together, he desperately wants a son, but his wife keeps bearing daughters. He grows to resent his daughters and wife because his desire to have a son is so strong. When she has her third child, another girl, the disillusioned Umber decides to raise to girl as a boy, Kanwar. In society of male predominance, it's natural for a father to want a male to continue the family name and traditions. Umber becomes increasingly protective over his son to the point of punishing his daughters if any harm comes to him. Then, when Kanwar turns 12 and has her first period, Umber overcompensates by pushing him to be more manly and tough. But as Kanwar (Shome) becomes of marriage age, more and more complications begin to develop and becomes next to impossible for Kanwar live a normal life. In a world where more and more people are becoming more gender neutral, QISSA is an interesting and fascinating look at that idea and struggle. Shome, as the older Kanwar, has such a powerful screen presence. She disappears into her character to the point where you don't know whether it's a man or woman playing this character until a pivotal, emotional moment in the later half of the film. Khan has a tougher role to play. He has to play the harsh, domineering patriarch, yet make us sympathize with his decisions. Khan balances both well, and even though his character seems rigid, he's able to draw some sympathy. One problem of the film is with the last 20 minutes. It goes from a powerful character piece to a strange, supernatural parable. The switch from the tradition storytelling to the meta felt unnatural and completely took me out of the film. While it's easy to see what the filmmakers were trying to accomplish with the supernatural aspects towards the end, it ended up feeling more polarizing than adding anything to the narrative. Even with the odd finale, QISSA is still a powerful film. The strong performances of Shome and Khan are worth the watch, and the themes of finding your identity and accepting yourself translate across any cultural overtones in the film.